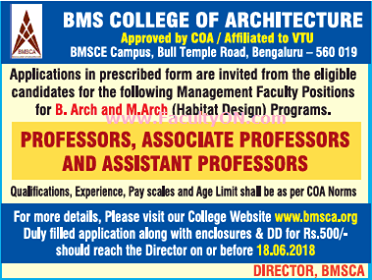 BMS College of Architecture, Bangalore has advertised in THE TIMES OF INDIA newspaper for the recruitment of Professor/Associate Professor/Assistant Professor vacancies. Interested and eligible job aspirants are requested to apply with in 18th June 2018. Check out further more details below. About College: BMS COLLEGE OF ARCHITECTURE (BMSCE Campus), we aim to provide an enriched academic environment. It offers a national and international platform whilst introducing essential values to pursue and fulfil the aspirations of the society in creating better place to live and flourish. We are on of the oldest and recognised institutes of Architecture for imparting architectural education in the region, and have been established for the last 35 years. We host a diversity of programmes offering a Bachelor’s degree in Architecture, a Master’s degree in Habitat Design and a Doctoral Programme. Apart from that, we conduct a wide range of short term courses and workshops. We provide a unique position of being with a technical group whilst also being independent designers and thinkers.